(CBS News) Recently released information that four brands of tattoo ink have caused an outbreak of skin infections has the inked-community concerned. More than 22 confirmed, four probable and 27 possible cases of Mycobacterium chelonae, a form of mycobacteria that is found in the environment, were discovered after some people were tattooed in various states. Untreated, the bacteria can cause lung disease, joint infection, eye problems and other organ infections. The bacteria is often difficult to diagnose and requires at least six months of treatment, according to the Food and Drug Administration (FDA). 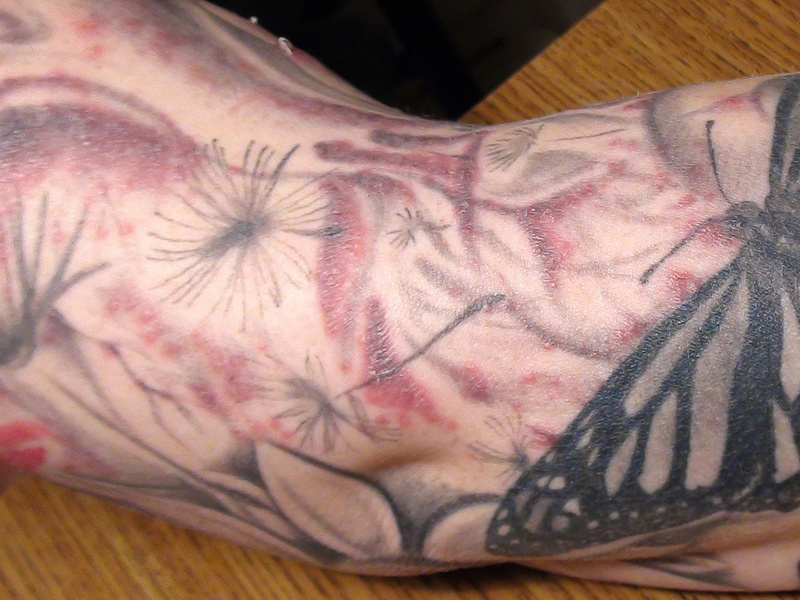 Physical symptoms include a rash and many little bumps, which looks like an allergic reaction, usually two to three weeks after receiving the tattoo. It may also be itchy or painful at the tattoo site. In light of the infections, the FDA cautioned both consumers and tattoo artists that inks and pigments can become contaminated by bacteria, mold and fungi. If consumers are experiencing odd symptoms from their tattoos, director of FDA's Office of Cosmetics and Colors Dr. Linda Katz advised them to report the complications to the MedWatch program. "Reporting an infection to FDA and the artist is important. Once the problem is reported, FDA can investigate, and the artist can take steps to prevent others from being infected," epidemiologist Katherine Hollinger, from the Office of Cosmetics and Colors said in the press release. The agency also added that ointments provided by tattoo parlors will probably not be able to stop the infection. Those ointments may also cause nausea or gastrointestinal problems and other side effects. Without the quick and correct medication, the infection could spread and cause a secondary infection. As for the tattoo artists, the FDA advised them to avoid using non-sterile water - which include tap, bottled, filtered or distilled water - to dilute the inks or wash the skin. Infection by Mycobacterium chelonae was found in Colorado, Iowa, New York and Washington state, according to the August 23 a Morbidity and Mortality Weekly Report from the Centers for Disease Control and Prevention (CDC). In the New York cases, where the majority of the infections were found, the tattoo artist's practices did not reveal any possible sources of contamination. This lead investigators to believe it was the ink, which in this case was a gray color used for shading. Sure enough, when the product was tested, the bacteria was found. In total, four different brands of grey or black ink were identified as contaminated. Authorities believe that the bacteria was able to enter the ink during the manufacturing process, where contaminated ingredients or unsafe practices may be used, or when the tattoo artist diluted the ink with nonsterile water. In the New York cases, the tattoo artist did not dilute his product with water, and other water and samples taken from the shop did not reveal the bacteria. The New York cases were described in greater detail in the August 22 issue of The New England Journal of Medicine. Another group of from Washington of three confirmed cases and 24 possible cases was later identified to be infected with different bacteria, Mycobacterium abscessus. While the bacteria was not a nontuberculous mycobacteria, but it did cause skin reactions that persisted for an extended period of time.